Another soccer practice another bunch of four-leaf clovers found underfoot. These three I found near the basketball court. Leah and I had big plans to shoot some hoops while Olivia was at practice. Unfortunately our basketball had other ideas. It was just plain too flat to be of any good use. We tried to pump it up but no matter what we did that basketball just kept being difficult. We called it quits after 20 minutes of fooling around with that flat basketball. Adelynn always eager to have a good time didn't care one bit about the ball. She was enjoying herself running in circles on the court. 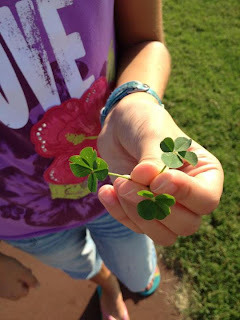 As we gathered up our stuff and began walking to the car I noticed a four-leaf clover. I bent down and plucked it up. It was Leah who threw down the challenge. She mentioned something about it being impossible to find three four-leaf clovers in less than a minute. I said that it would be difficult but that it could be done. She laughed and gave me a skeptical look. Meanwhile I had spied two more four-leaf clovers not far from her feet. Picking them I handed them to her and said "Not so hard" as she began to laugh hysterically. Only her mom could be that lucky with four-leaf clovers. We paused a moment to take a picture. Evidence of the crazy challenge met by her wacky mom. The clovers were put in our road map with the others. Many others. Between the three of us girls someone is usually finding a four-leaf clover. Never ones to toss them aside we just stuff them in our map thinking we'll remember to take them out and save them forever. One day we will find a use for them. Maybe frame them. Or send them to friends. In the meantime we just love to find them unexpectedly at the park.